More details are in on two Hennepin County commissioners’ plans to help Minnesota United build a new stadium in Minneapolis, and it looks like they’re offering more than just some future sales tax money, as was reported yesterday. Rather, Mike Opat and Peter McLaughlin are looking to siphon off sales tax money currently going to such things as libraries and youth sports, while doing an end run around Minneapolis Mayor Betsy Hodges on exempting the stadium from property taxes. Opat and McLaughlin’s plan would add United’s stadium to the 0.15 percent countywide sales tax that helped build Target Field. Under that legislation, sales tax proceeds were limited to five projects: retiring the bond debt, additional library hours, youth sports activities, operating the Ballpark Authority and capital expenditures around the park. The soccer stadium would be added to this list, as well as youth sports spending in Hennepin County suburbs. That’s nice that they want to increase youth sports spending for the suburbs, but it’s important to note that adding items to the list of things funded by the sales tax surcharge doesn’t actually create any more sales tax revenue. Yes, sales tax revenue is currently coming in faster than expected, but adding more items to be paid for out of that fund inevitably means either 1) the tax will have to be continued for longer than it would be otherwise, taking more money out of taxpayers’ pockets, or 2) spending on other items on the list will have to be reduced. The Target Field bond debt has to be paid off one way or another, so that leaves only library hours, youth sports, and Ballpark Authority operations on the chopping block — your guess which one will end up drawing the short straw. The deal would solve one major problem for United, which wants to be free of property taxes. Under Opat’s plan, the team would buy the site — for $30 million, according to the team — and give it to the Ballpark Authority. “They would operate it, we would own it,” Opat said. Mayor Hodges has refused to have the city take ownership of the stadium land, since that would exempt it from the property tax rolls — but the county is likewise tax-exempt, so it could get United its tax break just by agreeing to take on the land itself, thus cutting Hodges out of the loop. What all this would cost the public is up in the air, since Opat and McLaughlin haven’t said how much sales tax money would go to United. And it’s all still in the spitballing stages — the sales tax change would need approval of the state legislature, and this hasn’t even gotten a hearing from the full county commission yet. Still, it looks even more clear that United is trying to repeat the magic that its co-owners scored with Hennepin County nine years ago, when that body agreed to throw public cash at a new Twins stadium when neither the state nor city would. As I always like to point out, in the stadium-demand game, you only have to put up one win, and you’re good forever — or at least, for the couple of decades before it’s time to demand a new stadium. So, the entire point of this post is that this will “take away books or sports!” As of right now, Minnesota United is not contributing to this tax in any way as they are not in hennepin county. You can’t say they will take away anything without also including the money they will put in. If they move downtown, they will instantly contribute to this tax. Do you have ANY figures about how much they would contribute? Or how much would be pulled out for the stadium? I don’t see anything other than wild conjecture and scare mongering. The financial impact of the stadium could be a net benefit and add more books and suburban sports. It would be lovely to see some real reporting instead of just speculation. Generally kind of hard to compute anything when stadium deals go from “back of the envelope” to “done deal” without much public scrutiny. This appears to be another case. How much, exactly, do you believe a soccer stadium that hosts maybe 25 events a year would contribute in tax revenue? The same as an office building filled with people? A block of restaurants and shops open every day? A parking lot? I think most people would say less than most if not all those options. The sales tax surcharge isn’t a tax specifically on sports — it’s on all sales in the county. But if you want an estimate, the average MLS team brings in about $20 million in revenue, which would contribute $30,000 a year in sales tax surcharge money if all that is on taxable sales (which it isn’t, since some of it is TV money) and all of it is spending new to Hennepin County (which it wouldn’t be, because some of it would be spent instead of on Twins games, etc.). If you want to count *all* sales taxes, you could get to $1.375 million a year by the same dubious measures. The actual amount of new sales tax revenue thanks to United would probably be in the low six figures at best, so suffice to say that if Opat and Co. want to give United something on the order of $500,000 a year, I won’t complain too loudly. Somehow I don’t expect they’ll stop there, though. Interesting that this article is coming from the Pioneer Press. I seem to recall when sites were being considered in Ramsey County, most of the critical press on them was coming from the Star-Tribune. Maybe if we get enough of a Twin Cities newspaper proxy war over MNU’s stadium, the stadium itself will be stopped. My complaint is specifically with THIS tax. I am not debating the over-all subsidy package at this time, only THIS article. Currently the team is paying $0 into this because they are in another county. If they move to downtown, they would pay into this. So no matter the other tax implications, they would not be contributing to this specific tax. With that in mind, the author cannot be intellectually honest without including any new additions to this specific tax having the stadium in downtown Minneapolis would provide before he talks about what will be spent out of this tax. If you want to wrap this into the larger discussion about the tax breaks, please do. But trying to hammer this as a stand alone point is dishonest. sorry, typo above. If they move to downtown they would *NOW be contributing to this tax. 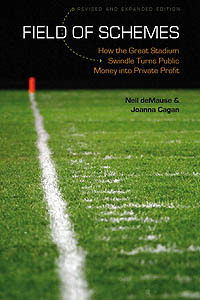 It seems to me that the author has stated in his comments above that his best rough guess at this point is that a sales tax redirect FBO of a soccer venue would be at least a few hundred thousand annually over and above what the stadium would “pay in”. The property tax exemption might be of more concern. In Santa Clara the 49ers stadium is except from property tax (except on event days) because it’s operated under the city’s authority. Because the silicon valley is booming right now this is probably a significant opportunity cost to the city/county as an office building wouldn’t be exempt from such taxes. I see no logical reason why sports teams should be given special treatment in regarding to property taxes. Maybe Santa Clara is booming BECAUSE of the Niners’ stadium. Ever think of that? Are you seriously suggesting that Santa Clara is booming because of the stadium? Really? You are saying, with a straight face, that the Bay Area is booming, not because of tech jobs and VC money being shout out of those pneumatic T-shirt guns, but because of the 49’ers? There’s a gold rush going on, but the Niner’s have nothing to do with it. Collin: Given that all studies of new stadiums and/or teams have found the sales tax impact to be indistinguishable from zero, it would be dishonest for me to count that as offsetting the very real dollars being given to United under this plan. The best thing you can say about a United stadium is it might steal a couple hundred thousand a year in sales tax receipts from across the river, if you’re lucky. That’s not nothing, but it’s close. I recently clicked on some stadium related article in the LAT and an auto play ad from your friends at Goldman Sacs started to play. It (the ad) showed how the Levi’s stadium revitalized a downtrodden backwater that is north Santa Clara with one hand. Let’s see where the city is in a few years when reality sets in though. And maybe Wisconsin is booming because of the PACKERS? That ad has followed me around for awhile now, popped up again yesterday, don’t remember where. I’m 99% sure it’s because I make regular visits to this site. Ad tracking systems have apparently been designed with a sense of humor. Colin: I live just outside of the Santa Clara city limits in San Jose and was a resident of Santa Clara for 17 years. I can tell you that, with the exception of its two outward-facing restaurants, and Niners museum, Levi’s stadium has done NOTHING, ZERO, ZIP NADA to enliven or enrich the city. All the “boom” around Levi’s was there well before the stadium even got built (thank you Apple, Google, Facebook, Intel, etc. etc.). Five miles from the stadium is the the city’s “downtown” (and I use that term loosely) which is still the same sub-par two square blocks it was 10 years ago. What Levi’s brought the city was traffic and noise nightmares for the nearby neighborhoods, the closure of a highly-used youth soccer park (tha the Niners are trying to move for more stadium parking) and bike trail on event days, and an ongoing distraction for the city council and staff which must take away from serving the people to serve the needs of the 49ers. The upside of the stadium is all smoke and mirrors. I apologize to people who might be upset with me getting a thread hijacked again. I’m sorry, I just can’t help reading these type articles without relating it to what happened in Santa Clara. I live in Mercer Island WA now though. I actually see Century Link field and the Seahawks training facility a lot more than I ever saw the 49ers places. However at least Mercer Island didn’t help pay for or subsidize the Seahawks. I really hope the Seahawks get to rain on Santa Clara’s parade next year–it would be just desserts.